You are a runner! Simply. Run always, no matter what. You deserve it. That was an awesome dissection of your challanges and I am sure it helped to write it down. 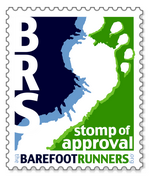 I read the same article as I run at 240lbs right now, and knowing what little I know about barefooting, I called BS about the shoe bit too! I was very injured at the end of my first half marathon training and I directly attribute it to the false sense of security the high cushioning shoes they advised me to wear gave me. Since that time, I got rid of my orthotics, insoles, and now my shoes and my knees hips back feel amazing! Do what you do for you! Thank, Neil, for bothering to read my ramblings. It's a weird kind of lonely adventure going out to run barefoot, so having a place to write about it, and another fellow human to observe and comment, is great. I think I found that article as a link on your blog. So, thanks for that too. Fresca, I found your blog through Barefoot Ted's and I'm soooo excited!!! I too am an overweight exerciser, and I have found that any foot pain or hip pain has disappeared after only walking/running about a week. It's amazing! Your blog is just what I needed, to know that someone else out there is blazing the trail for us chubby girls. Thank you for the courage it must have taken to start running again, as well as to start running sans shoes. Feel the freedom of the feets!!!! Kim, Thanks for your enthusiasm and excitement. It was really amazing to not have hip pain, or really any pain in the joints at all after starting to run barefoot. I think that kind of pain discourages a person from continuing if she gets it in the beginning, so to have a way to go out running and feel like the joints are safer is really wonderful. Hi, Judith. It's great to see your comment. Yes, I'm still running, except that for a few weeks ago I experienced an injury from Kung Fu and have to take a little time off to heal the injury. I'll be writing about that. With barefoot running I do not have toe pain because instead of pushing off with my toes, I am lifting the feet. I was very careful in the beginning not to run too far or too frequently. I only ran 100 yards or so my first time out and very gradually built to running a mile. I definitely think that overweight people can do this safely, but it must be done very carefully and slowly. We are dealing with a LOT of extra forces and stresses on the body due to the extra weight and we CAN become strong enough to absorb these forces, but we have to work up to it gradually. An efficient technique that minimizes all the forces is a great help to overweight runners. That's why concentrating on good form, in my opinion, is more important for overweight runners than concentrating on speed or distance. A lot of overweight runners are eager to be doing longer distances in the hopes of burning more calories so they can lose weight. That impatience can set us up for failure and we'll do too much too soon and then end up doing nothing -- right back in the same boat as we started. Slow, careful progress will reap big payoffs later. Thank you so much I'll:-) stay focused. Loved your story! I'm 5'2" & 288 lbs. I am looking for guidance. I bought the new Balance minimus before reading this...just walking through my home is lovely! I do, although, have knee issues that have been following me for over 2 years. I want to walk/jog - LOSE WEIGHT! Any advice would be great! Hi there, Chowie, thanks for your comments. I am far from an expert on how to exercise or lose weight. I have experimented with different programs and I read a lot and try to use common sense when devising exercise plans for myself. There is not a lot of information on plus sized fitness. There is SOME out there, but you really have to dig for it. I am very careful about how much stress I put and how fast. With everyone who approaches fitness, heavyweights and lightweights, there are a lot of injuries from using poor form and progressing too much and too fast. The need to use proper form and progress slowly and build strength gradually is especially true when you are carrying extra weight into fitness. I believe it can be done but a plus size person has to be even more mindful of these principles. My advice for plus size people is to be happy with less for a long time. Consistency is more important. Be happy with a modified version of a movement and be content to use that modified version for a long time before you move on. Let strength develop very gradually. Be content to be slower than all the other people. Let speed come later. Have lots and lots of PATIENCE and FAITH in the process. Learn to love movement for movement's sake, not results. Learn to become really curious about the best way to do things -- how to step, what angle to touch the ground, etc ... Live in the moment and love what you've got now! Also, instead of seeing extra weight as a liability, see it as an asset. There is a whole movement of fitness people who do bodyweight exercises. The extra weight can be used to make yourself strong if you're smart about the way you work. Lastly, read everything you can get your hands on from good sources. If you want to run barefoot, read Barefoot Ken Bob stuff, Jason Robillard, Michael Sandler, etc ... Google "plus-sized fitness" and "exercising when overweight" and find message boards where there are lots of people working out at heavier weights discussing their programs. All this comes from a non-expert. Hope it is helpful. Fantastic posting! Thank you for sharing. It is always very difficult for plus size people which no-one else seem to remember or think of. All the additional forces we have to keep in mind still, no excuse, we can use it to our advantage like you said, if used properly. Thank you so much for sharing your experience! It was such an encouragement to read as I am beginning my weight loss journey. I did have a question & forgive me if I overlooked the question, but where did you begin running? Outside or on the treadmill? Cassandra, thank you for your comments. I started running outside.